Windows Mixed Reality is Windows-compatible headset that doesn’t need a powerful PC or complicated setup for immersive gaming and entertainment. It’s affortable and price initially started at $299 (roughly £250 or AU$400, converted) for the headsets alone. In case you have a such good Windows Mixed Reality on hand, and would like to setup your own 3D movies for setting up home media, you have come to the right place. This article will guide you how to rip 3D Blu-ray movies for watching on Windows Mixed Reality with best 3D effect. As Virtual reality device, WMR supports common 2D videos and 3D videos in side-by-side formats. To rip 3D Blu-ray for WMR, we suggest you try Brorsoft Blu-ray Ripper, which can rip and convert 3D movies from Blu-ray disc into 3D side-by-side MP4, MKV, WMV, AVI, MOV etc formats without losing quality. Besides, the ripped 3D videos are also compatible with more VR heasets including: Gear VR, HTC Vive, Dream VR, Cmoar VR and more. If you’re running on a Mac, please turn to Brorsoft Blu-ray Ripper for Mac. Install and launch the best 3D Blu-ray to Windows Mixed Reality Converter, click “Load disc” button to load your 3D Blu-ray movies to this program. Here, 3D ISO image, 3D Video_TS Folder, 2D/3D DVD are supported as well. Click Format drop-down menu and pick up a proper 3D format i.g. MP4 Side-by-Side 3D Video (*.mp4) for Windows Mixed Reality. 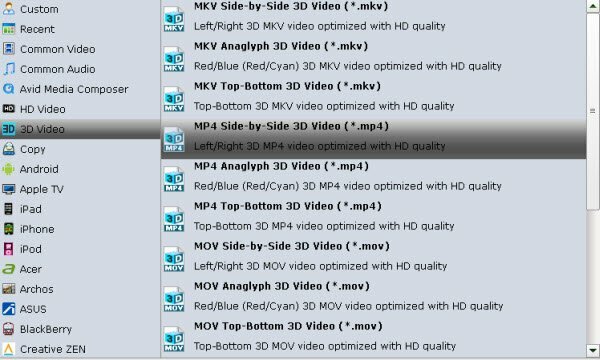 3D Side-by-side MP4 is the most popular formats for most 3D VR headsets and 3D TVs. Tips:Tap the “Settings” button to adjust your target video size, bitrate, frame rate and 3D depth. If you want to get best video quality, pls switch them to “original”. With above setps, tap the “Convert” button to rip and convert 3D Blu-ray for Windows Mixed Reality heasets. This software will finish all the 3D Blu-ray conversion in fast conversion speed. Once finished, you can find the output 3D videos on the PC hard drive, save the 3D videos in USB and play the converted 3D Blu-ray videos on PC with Windows Mixed Reality without hassle. This entry was posted in 3D Blu-ray, VR and tagged play 3d blu-ray on windows mixed reality, rip 3d blu-ray to windows mixed reality, watch 3d blu-ray on windows mixed reality. Bookmark the permalink. Awesome! This really is by far the most useful thing on the topic I have ever come across. Many thanks for your work.